Fonts In Use is an independent project from Sam Berlow, Stephen Coles, and Nick Sherman; all fairly respectable names in the world of fonts. 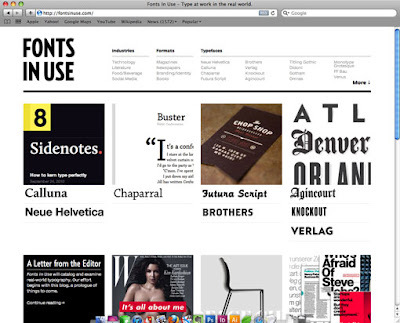 Their new website showcases pieces of design, identifies the typefaces, and has a little critique of the work. I love the idea, and their mission statement excites me. "This blog is a prologue of more to come. Behind the scenes, we’re building a searchable, sharable archive of typographic design, all indexed by typeface, industry, and medium."